Fifth completely revised edition, Amsterdam 2004; 148 p., ISBN 90 6665 590 9; € 19,50. The book is available in the bookshops and at www.dekantoorverhuizing.nl. 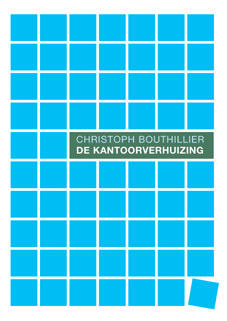 This book is at present only available in the original Dutch version. Please contact the publisher www.swpbook.com if you are interested in publishing a translation. Some 30,000 businesses move to other premises in the Netherlands each year. Removal come along with an enormous number of small and large tasks: tenders have to be invited, the new premises have to be fitted out, all those involved need to be informed, the post and telephone have to be organised, the layout of the rooms has to be decided, furniture has to be coded, cleaned, packed and a permission to drive through a pedestrian precinct might be needed. Many people walk around in a state of panic in their office long before the actual removal is to take place. However, there is an alternative. De kantoorverhuizing offers a structured approach to all jobs in connection with a removal. With good organisation, careful planning and following the many advice given in this book a removal will be a smooth operation. A lot of practical hints will prevent as many possible pitfalls. Included and available as a downloadable spreadsheet is a chronological overview. Moreover the reader will find addresses, literature references, lists of websites and software A downloadable measuring template for quickly measuring surface areas on building plans completes this book. There is detailed information on the preparation of a removal, the premises, communication and public relations, furniture and some additional tasks such as organising the open day in the newly occupied premises. Various environmental issues are covered as well. De kantoorverhuizing is obligatory literature for anyone in a company or institute who has to organise a removal. It will also prove very useful for internal reorganisations, which sometimes turn out to be more complicated than expected. And even for private removals the reader will find many useful elements. The author did not produce this book overnight. Prior to the book's publication it was tested extensively by facility managers, telecommunication experts, removal firms and their coordinating organisation in The Netherlands, SAVAM. After all, removal firms benefit from perfect preparation, too. At www.dekantoorverhuizing.nl you can order the book online and/or download contents pages and two other files that belong to the printed version.